Whether you're adding to your setup or just beginning, the Sonos One is a great addition for everyone. While it's expensive, the Playbase is one of the more convenient ways to up your home audio game without getting a surround sound system. If you want to get better sound for your TV in a medium-sized room, this is a great option. The best speakers are the one you already have, and the Sonos Connect lets you add those to your Sonos setup. If you want the best value, the Play:1 does the job especially since it can be found in a bundle of two. Sonos speakers are some of the best around if you’re into home audio. You can get a single speaker just for your room, or multiple speakers and set up an entire 5.1 surround sound system in your living room, it’s your choice. While it’s true that the company doesn’t have a huge product line-up like some other manufacturer’s, they do have enough choices that deciding which one is for you can be a bit confusing. So we thought we’d narrow down which speakers in the product line-up you should get depending on what you’re looking to do, starting with the Sonos One. Whether you’re new to Sonos or a veteran in the game, this speaker is one of their cheaper offerings yet it has the newest features. If you’re just beginning to dip your toes into the Sonos brand, then you should probably start with the Sonos One. Similarly, if you already have a few Sonos speakers, you should get the Sonos One anyway. The reason is that even though $200 isn’t exactly cheap, it isn’t absurdly expensive and costs about the same as some high-end Bluetooth speakers. Pricing aside, the main reason to get this speaker is that it has Amazon Alexa built-in. The Sonos One nails a lot of the main things you’d look for in a smart speaker, including a sleek design, great connectivity, and good microphones for picking up your voice. With Amazon Alexa built into the speaker, you’ll be able to play music just by speaking with your voice. And because Sonos speakers are so tightly integrated via their own mesh network (more on that later), you can control any Sonos speaker in your house. On the top of the speaker is a touch-sensitive pad for adjusting volume and pausing/playing music if you want to, but Alexa can also do so if you’re too far away to physically touch the device. Not to mention that the speaker is also humidity resistant, so you can place it in the bathroom if you want to really sing your heart out. If you’d rather start building or even add to your home theater experience, then the Playbase might be for you. While it’s definitely expensive at $699, it works perfectly whether you want it as a single, stand-alone solution to your TV audio or as a part of a large surround sound setup. Of course, there are several cheaper soundbars that will get the job done but only the Playbase will pair up with other Sonos products whether you currently own them or plan to get them in the future. The Playbase is also different from some of the other Sonos speakers in that this was designed to also act as a TV stand. So if you’re like me and don’t have space for a wall-mounted TV with a surround-sound entertainment system, the Playbase has your back. It can easily support a TV up to 77 lbs (35 kg) letting you up your audio game without needing to change your setup too much. The newest product in the Sonos lineup is the Sonos Beam, which is a smart soundbar designed for your TV. Unlike the Playbase, you can’t place your TV on it. But it’s small and compact enough that you should be able to fit it in with your TV without too many issues. If you don’t have enough room (or if your TV is mounted to the wall), you can also mount the Sonos Beam to the wall. As the newest product in the lineup, it has full Amazon Alexa capability so just like the Sonos One, you can control music and ask it questions the same you would to any Alexa compatible device. On top of that, it has a few features that make enjoying movies and television that much more convenient, like a night mode so you don’t wake up everyone in the house. Or the option to turn on the TV just by asking Alexa to do it, though this does require you have a compatible TV with an HDMI Arc input. The downside to the Beam is that it has fewer speakers than something like the Playbase or the Playbar, making it great for a small to medium sized room, but not ideal for larger entertainment setups. That said, it’s also cheaper than either of those options at just $399. What if you already have a few home speakers and are just discovering Sonos? Rather than having to throw your gear away and start from scratch like a psycho, you can just get the Sonos Connect. The Sonos Connect isn’t a speaker, it’s more like an adapter that allows you to connect your existing speakers to the Sonos network and stream music over WiFi. So you can convert your existing setup into the beginnings of your very own Sonos ecosystem. It does this by accounting for a number of different methods of connecting to it. Along the back, you’ll get RCA, optical, and even digital coaxial audio outputs. You can attach an Amazon Echo dot if you really want to see what it’s like to control your entire sound system with just your voice, or even an amplified turntable if you just want to play your own collection from time to time. While $349 is far from cheap, it definitely saves you money in the long run if you already have speakers and the alternative is to spend even more money on getting multiple brand new Sonos speakers. What if you’re not entirely sure that you want to commit to a Sonos system? If you just want to see what it’s like to have a connected speaker or maybe looking to get someone a gift, the Play:1 is their cheapest offering but it still packs a punch. It’s roughly (if not exactly) the same size as the Sonos One speaker we mentioned earlier so sound quality is going to be very similar, but it has a slightly more dated design than the newer, sleek option. You also won’t get any of the voice assistant features that Amazon has been incorporating into their newer speakers as the Play:1 was released well before that gameplan. So what do you get? Well, it still has the same humidity resistant build so whether you want it in the living room or the bathroom you shouldn’t have a problem. It’s worth mentioning that this doesn’t mean it’s completely waterproof, so if you’re looking for a speaker to leave outside you’ll have to look elsewhere. You can also mount these on the wall or on separate stands, so if you pick up the bundle with two Play:1’s you’re well on your way to having your own home theater setup. Why didn’t we recommend the Playbar? The Playbar is arguably one of the best products from Sonos, but it’s just a little too dated at this point to recommend over some new options. Sonos does a great job at supporting their products to make sure it works with the rest of their line-up for way longer than most companies, but we’d recommend just waiting for this to get refreshed before dropping the cash. The Sonos Playbar is one of their best products, but it’s a little dated at this point. We’re not saying that it isn’t any good (if you already have a Playbar you know that it’s still going strong), but it’s roughly five years old at this point and lacking the voice assistant features that’s sure to come to the product whenever it gets refreshed. Of course, if you don’t really care about voice assistant features then go for it. Good sound is good. Probably the main reason why the Sonos is synonymous with home audio is because they’ve done a great job at crafting their ecosystem over the years. All of their products work together seamlessly and you get complete control over everything via the free app. Whether you want to play different songs on different speakers, play a podcast throughout the house, or just watch a movie, Sonos has you covered. Plus, as we mentioned before, Sonos does a great job at making sure all of their products are kept up to date for years. So if you buy a few speakers now you won’t have a problem adding a new one to the setup five years down the road. The best part about Sonos is also one of the more frustrating parts. 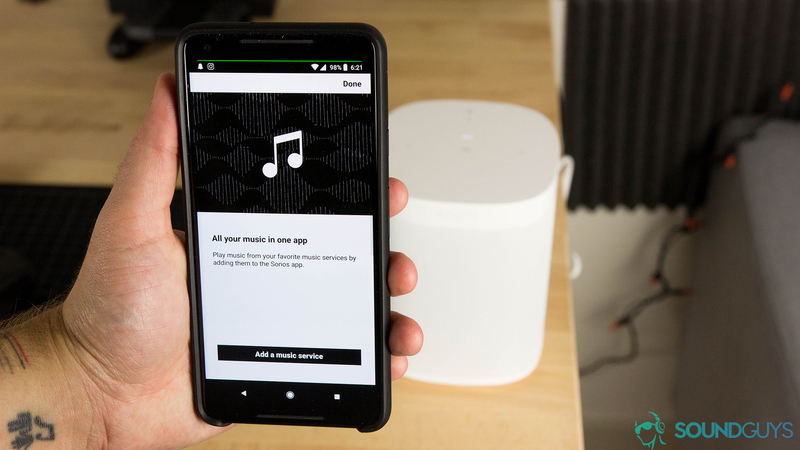 The way that you’re able to control all of your speakers via an app is because all of their products connect to each wirelessly over your home WiFi. During setup, Sonos products will create their own mesh network exclusively for Sonos that’s piggybacks off your wireless router. This is how you’re able to seamlessly stream music to multiple at once. The music isn’t coming from your phone like it would be if you were streaming via Bluetooth, you’re just using the app to tell the speaker where to play from. It then pulls down the content from the internet all on its own. This means the range is way better than it is on Bluetooth. You don’t need to be within 30 feet of the speaker. As long as you’re connected to the same WiFi you can control your Sonos. That said, it’s also a bit of a bummer that there’s no Bluetooth streaming option available. So if your internet goes down for whatever reason, you’re out of luck. If a friend comes over and wants to play you something they’ll have to use the Sonos app they can’t just connect to your speakers. Sonos has made it clear that a big part of their plan moving forward in a world of smart speakers is to just be compatible with all of them. So unlike the Homepod, which only has Siri built in and only lets users stream music via their Apple Music account, Sonos aims to be compatible with every voice assistant and every streaming service. The choice is yours as to which to use, the company just want to be the speakers you play off of. At the time of this post, newer Sonos products come with Amazon Alexa baked in, with Google Assistant scheduled to come to their products via an update in 2019 and Siri available in a roundabout way if connect through AirPlay 2 and have an Apple Music account. This one is for the home theater nerds out there, because unfortunately, Sonos does not support Dolby Atmos. It does, however, support Dolby Digital 5.1 which you can take advantage of if you have a classic 5.1 surround sound system. Unlike the classic 5.1 system, Dolby Atmos is an object-based audio format, meaning that sounds can be packaged into “bubbles” of 3D audio. Practically, this just means that speakers that support Dolby Atmos, like the LG SK10Y, can bounce sound off of the ceiling to create a more immersive sound experience. And while it’s hard to explain without breaking out my “marketer language-to-English” dictionary, trust us when we say that the effect is actually really cool and it’s kind of a bummer that it isn’t supported. Even the new Apple TV supports Dolby Atmos. The team at SoundGuys has spent years reviewing, testing, and generally enjoying any and all audio products that we can get our hands on. Adam and Lily have heard, tested, and compared numerous speakers and headphones in their time at SoundGuys, as has Chris who has the added bonus of having spent time testing products for the likes of USA Today and Reviewed.com. In short, we know what we’re doing. If you have some time feel free to read our ethics policy while you’re here!